At long last, we launched the DVD of Disarm, our documentary feature film on landmines, at at the beautiful Scandinavia House venue near the United Nations in New York this Monday, 2 March. A massive snowfall the night before and throughout the day had us worried that the event would be a bust, but last minute RSVPs filled the room for our event convened by IndiePix and ICBL to launch the Disarm DVD and commemorate the 10th anniversary of the international treaty banning antipersonnel landmines. While the snowstorm prevented one of our star guests, Nobel Peace laureate Jody Williams, from speaking at this event, and Adam Yauch from the Beastie Boys and Rolling Stone political cartoonist David Rees from attending, we still had a full house of approximately 150 VIPs including diplomatic representatives from 20 countries (including several ambassadors), mine clearance and disarmament officials from the United Nations, film industry representatives, a number of artists including DJ Spooky (Paul Miller), and many members of the press. After a brief reception and panel discussion between Disarm’s executive producer Mary Wareham, Colombia’s Ambassador Claudia Blum, Norway’s Ambassador Mona Juul and Steve Goose of Human Rights Watch, we screened Disarm, followed by a film Q&A session with Mary Wareham and director Brian Liu. Many thanks to IndiePix and ICBL, our speakers, and our audience for braving the cold weather! ToolboxDC has designed a limited run of Disarm T-Shirts available for purchase. The film can be purchased from Amazon, rented via Netflix, and shortly it will be available from the IndiePix website for digital download from anywhere in the world. The Disarm DVD is loaded with extras: 40-minutes of deleted scenes, subtitles in 5 languages, trailers, and director's commentary. 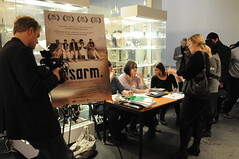 Contact us if you want to subtitle Disarm into your own language or hold a public screening of the film.